its a normal iksar model, nothing special. You're thinking of "Baron Yosig's Skeleton"
This illusion also makes you apprehensive to everything on the Sebilisian Empire faction. That is almost a true statement - scaled wolves are not fooled by the illusion (they /con as scowling). Boas don't appear to be fooled either (they /con as threatening). This is a very important detail. Do the quest in the order given by the dragons and listed here. They will not take any items you've prelooted. Tried this at two different stages in the quest, as I duo with another character and tried getting their items the same time I got mine simply to save time (made sense since you can do this on many other quests). Ended up having to redo the PITA pile of bones part, as well as items like the tar. Hopefully others won't have as hard a time as I did with this warning. Heading East from the main gate, after the first building on the right you will see 4 pillars with 2 Iksar Masters in the middle. Between them is a Pile of Bones. Hard way: Kill Masters, open and then loot bones. Easy way: Have someone WITHOUT THE TASK /open the bones for you, then loot. You will not get aggro from Masters. Hand in to Phara'Dar to complete quest. Head NW from Phara'Dar and find Tharrolls Tower. Watch out for the undead guards. Be invis (not ITU), and enter the tower through the north door. There are no undead here. While invis hail the Shade of Tharroll and say 'earthly remains' . The task will update. Head into Kaesora. Moving east from the main gate go into the second building on the left. Be invis. You will see a pile of bones in the centre of the room. Hard way: Clear the room, then open and loot. Easier way: someone can train the room clean, then you loot. It is also possible to suicide loot this if you are quick. Hand in to Phara'Dar to complete quest. Kill random Iksar till ribcage drops. It is a good idea to grab the Food Supplies task from Severilious and kill Iksar Hunters, as they drop the ribcage and you are updating the other task as well. -Head to the NE part of zone. There is a little island with 4 pillars. Task will update when you are in the right place. - Wait for Calegos, The Living Flame to spawn. He only spawns between 10 pm and 6 am game time. - Hand in the Ribcage to Calegos. - Go to Field of Bones. Yes, Field of Bones. Not Field of Scales. Easiest way to do this is either POK stone to Cabilis, or if you are already in FOS zone out via Emerals Jungle , then zone back in. - Once in FOB, go to Kaesora, and fine Commander Koh. He is now an undead iksar, and drops a Petrified Iksar Skull. - Go back to FOS and hand in Skull to Phara'Dar. 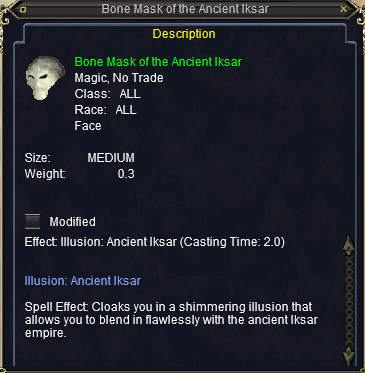 Hail Phara'Dar again to get the Bone Mask of the Ancient Iksar. KUDOS GOES OUT TO: Sarenot the mage, on the mage boards for collecting this info. Commander KOTH (not Koh): Easy kite, can be snared or rooted. Quest starter is Phara Dar in field of scale. This mask makes you indifferent to everything in the "Field of Scale" theme as far as I have seen except for the "critters". I was able to run through every non-instanced zone with apprehensive faction to everything associated with the Sebillisian Empire at max-kos faction. Unfortunately, at this point in time, nothing I hailed gave me a response.